We want our Chicago patients to know Ptosis means droopy. Upper eyelid ptosis (blepharoptosis) means drooping of the upper eyelid(s). The upper eyelid margin (where the lashes are) is lower than normal. It can be mild to severe. If mild, it can be subtle and not noticed by the patient or others. If severe, it can cause obstruction of the field of vision and the patient will have difficulty keeping his/her eyes open. 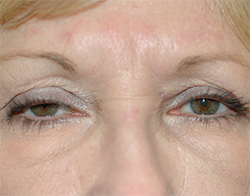 In these cases, the patient will elevate or arch their eyebrow in order to assist lifting the droopy upper eyelids. The visual obstruction is relieved once the upper eyelid are lifted (ptosis surgery). However, children with ptosis may develop lazy eye (amblyopia) with permanent visual loss if not addressed promptly. What Causes Upper Eyelid Ptosis? There are various causes of upper eyelid droopiness (ptosis), including congenital (born with it), traumatic, neurologic, and most commonly age-related loosening/weakening of the levator muscle tendon (muscle responsible for lifting the upper eyelids). The levator muscle lifts the upper eyelids about 15,000 per day, every day! One can imagine that the tendon attachment can get loose, which causes the upper eyelids to drop (ptosis). This weakening of the levator muscle or tendon can be exacerbated by any previous eye surgery due to stretching of the muscle or tendon. The most important factor to consider in evaluating true upper eyelid ptosis is to rule out other causes of pseudo-ptosis, including upper eyelid dermatochalasis (excess puffy upper eyelid skin/fat) and droopy eyebrows. As mentioned earlier, the position of the upper eyelid is determined by the levator muscle/tendon. Excess or puffy upper eyelid skin will NOT a change in the upper eyelid height but give the illusion of it. The treatment for this would be upper blepharoplasty where excess skin/fat is removed from the upper eyelids. Droop eyebrows can also cause heaviness of the upper eyelids and give appearance of droopy upper eyelid. The treatment for this would be brow lifting. Many patients have combination of the three factors that contribute to "droopy" upper eyelid (ptosis, dermatochalasis, and droopy eyebrow), requiring a combination of ptosis surgery, upper belpharoplasty, and/or brow lifting. How Upper Eyelid Ptosis is Corrected? Upper eyelid ptosis surgery works by surgically tightening of the levator muscle to raise the droopy upper eyelid. 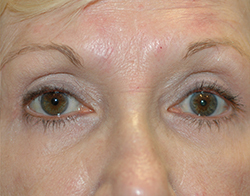 There are various technique available to tighten the levator muscle, depending on the type and severity of the ptosis. Ptosis surgery can be performed through a posterior eyelid approach (internal ptosis surgery or mullerectomy), resulting in scar-less surgery with excellent eyelid contour. It could also be performed from the front skin approach (external ptosis surgery), where the incision is hidden in the eyelid crease line. In congenital ptosis or ptosis due to very weak levator muscle, the upper eyelid has to be linked to the forehead muscle (frontalis muscle) in order to use the forehead muscle to lift the droopy upper eyelids. This technique is called frontalis sling. Dr. Szatkowski will evaluate and perform various tests during your consultation and then determine the best form of correction for the individual patient. For more information on Ptosis in Chicago, IL call us at (312) 332-4296 today!